We got quite a bit of snow yesterday afternoon. I grabbed a ride home from work with a friend who owns a big ol’ truck. It took us three hours to get eight miles. We had no problem in the truck with the driving conditions, but enough other people did that it was just gridlocked. After that I wasn’t feeling up to running out in the snow. I only wanted to run two miles, and getting all dressed up for the snow seemed like a hassle, and Sweetie would worry about me, and… and… and I… I… oh the shame. I ran on the… the… treadmill. The Eugene Marathon people have published their 2010 marathon route. They’ve made some significant changes from last year, most of which look like improvements. The big news that they’ve been trumpeting is that the race now finishes on the Hayward Field track. However, since it finished right outside Hayward last year, that alone doesn’t affect the route much. What else have they done? The start is straightened out this year. Simplified the start. It’s hard to tell from the map, but I think (and hope) they have us starting headed south on Agate this year. They’ve gotten rid of the hilly and winding jog over to Fairmount street this year, and instead have the race running straight down Agate for about three quarters of a mile after the start. That’s a very good thing. Crossed the beams. To make up some length lost in straightening the start, probably, the route now turns right on Harris after running west on 24th. We take Harris north to 18th, and 18th west to Hilyard. It’s initially alarming to look at the map and see the route crossing itself like that, but even the slowest walkers should be past the crossing points by the time the leading runners come though seven miles later. Smoothed out some stuff, but not all of it. Miles two through eleven are identical to last year. I’ve heard that the city has repaved the previously-quite-bumpy Amazon park bike path, though, which is nice. The route still looks like it has the same little twist and curb-up as it enters Amazon Park, though, which is unfortunate. I’m a little surprised they haven’t rerouted onto Amazon Parkway instead of using the bike paths. Retooled the Springfield Section. This is a massive change. There is a lot less trail and a lot more road now in miles 11-16. The biggest improvement is that once the marathoners and half-marathoners split up, they never rejoin again. This was a big issue last year, with faster marathoners having to weave around slower half-marathoners on narrow bike paths. This year, the half-marathoners cross the Knickerbocker footbridge but the full race continues east on Franklin, eventually crossing the river over the Springfield Bridge. We head farther east into Springfield than in years past, then turn north and head up 8th and 7th to Centennial. And we stay on Centennial all the way back to Autzen Stadium and Alton Baker Park. There might be a bit of a hill getting over the Centennial overpass over I5. I’m definitely going to miss some of the riverside trails they’ve eliminated here. I think it’s almost certainly a faster route now, though. Left the finish alone. After Alton Baker park, the last nine miles are identical to last year. And that’s a good thing. These riverside bike paths are the emotional heart of this route. 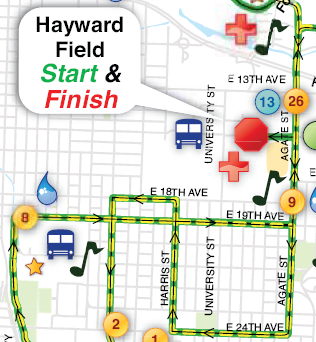 About the new finish inside Hayward: Judging from where the “26” is on the map, it doesn’t look like we’ll get to run much on the track at the finish. It would have been nice to let us do 3/4 of a lap or something. Of course, in real life, by the time I get there, I won’t be able to care less about such little details. So far this year I’ve run 1,458 miles. Odds are good that I’ll run about 20 more during the four days left before New Years, leaving me with 1,478 miles in 2009. (I ran 1,222 miles in 2008 and 955 in 2007.) You might think I’d be ticked off that I didn’t make it to a nice big round number like 1,500, but the truth is I rarely pay any attention to my yearly mileage. Unlike my weekly mileage, which I obsess over completely. It has been such a pleasure these last weeks to be able to make plans and carry them out, instead of being at the mercy of an injury. Simply announcing to yourself “I’ll run seven miles Monday and Wednesday, five on Thursday and sixteen on Saturday,” then watching yourself do exactly that, can be very gratifying. That’s just what I did this week, too: a 35-mile week with a 16-mile long run. The long run was this morning, and it went remarkably well considering all I had drunk the day before. (Merry Christmas!) I ran it on a moderately hilly section of Wildwood — an out and back north from the NW 53rd trailhead — but still averaged 9:46/mile, which I consider pretty good for that terrain. I only pushed the pace the last two miles. It was cold and frosty and beautiful out there. In my virtual cross-country run, I’m closing in on halfway across Oregon. Monday night’s run had its ups and downs. I felt strong and the weather was beautiful. I was running with a nice group of folks. But it was a strange night. We had only run one block when we saw a car crash. Actually we heard the crash, then looked over to see the results. It was “just” a rear-ender at fairly low speeds, but it still looked like a mess. Since none of us had actually seen anything, we ran on. Six and a half miles later, almost done, I saw a little dog run into the street ahead of us. I’m almost certain it was a Chihuahua. It ran right into the path of a car. There was absolutely nothing the driver could have done. The sound of impact was sickening. I didn’t look. Saturday morning I ran a 13-mile loop in Forest Park, on Leif Erikson, Nature trail, Wildwood trail, and Lower Macleay tail. Actually it wasn’t entirely a loop; I stuck a one-mile out-and-back in near the end to make up some mileage I had missed by not planning my route out very carefully beforehand. It’s nice to run a loop instead of an out-and-back sometimes, but it does make it harder to figure out the distances. I seemed to be feeling pretty good Saturday morning. Despite the hills and some mud, and without feeling like I was pushing myself too hard, I somehow averaged a 9:17/mile pace. That capped a 30 mile week — an intentional step-down from the week before. This week I want to do 35. Saturday I ran on the somewhat-obscure trails from Terwilliger Boulevard, near the Chart House, up to Council Crest then down to the Vietnam Veterans memorial (behind the zoo). These trails are part of Portland’s “40-mile loop” (which is already longer than 40 miles but is still not a loop). They are well-marked and mostly quite secluded, considering how deep within the city they are. (They have even addressed the trail-marking situation on both sides of 26, which used to be a problem.) There is a trail gap a few blocks long after you come off of Council Crest, and you have to run on shoulders and sidewalks to get across US 26. Other than that, though, this route is all trail. Mostly hilly trail. I guess that’s why these areas are parkland: too hilly to build on. I got started a little late in the day (après-hangover) , and by 4:30, with a couple miles left to go still, it was already starting to get dark. At first I thought it was just getting really overcast or foggy, since 4:30 seemed like it was way too early for darkness to be setting in, but I suppose that’s December for you. I raced against the darkness for the last (and fortunately downhill) mile back to my car, and I’m pretty sure I could still see something of the trail when I finished. Today I ran five miles from my house, bringing my distance for this week up to 32 miles. I am feeling it. I feel sluggish and tired. My knee feels 100% solid though. Have I mentioned that I registered for Hagg Lake? You are currently browsing the I'd Rather be Running blog archives for December, 2009.